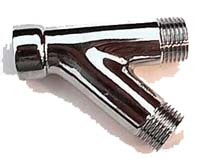 Turn a standard shower pipe into two standard sized shower pipes for double your showering pleasure. This pipe has no restrictions, gives you full flow. Customers have also ordered one or two flow controls with this pipe, also available in our accessories section.